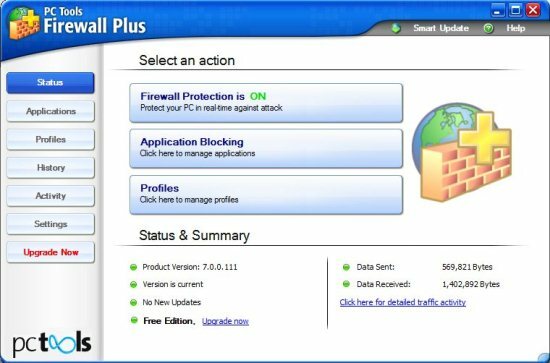 PC Tools Firewall Plus is a Free Firewall Application to protect your computer from intruders and malicious network traffic. It controls both uploading and downloading activities. This free firewall is very easy to use; but it can be used by both advanced users and beginners. It’s interface is also easy to use; as it’s options are all listed to the left side as shown in below screenshot. As soon as you install this free firewall application, it requests a permission to trust or untrust the network you are connected to. After you choose the trusted option, the application minimizes to the system tray. Then it asks for permissions on applications using the network; choose the options accordingly. 1. Status: In this option you can ON or OFF firewall protection when needed. You can navigate to applications management or profiles by clicking on the respective options. You can also see the status and summary of this free firewall application. When you click on click here for detailed activity you will be directed to the activity window. 2. Applications: In this applications option you can control both In and Out connections. When you click on the colored dots next to the application, it shows a drop down menu as shown in below screenshot. In that menu you have the option to Block, Allow All, Allow Trusted, and Ask options. 3. 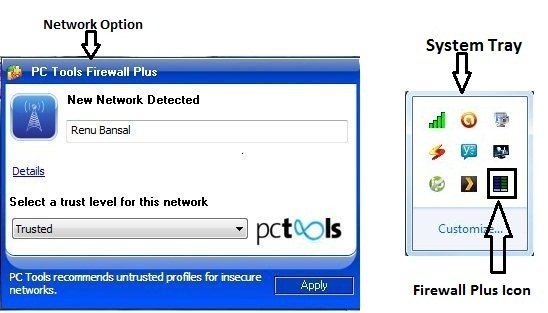 Profiles: You have the options for Port Override and Trusted IP List. Port Override option allows port or port ranges that are added to the list. Trusted IP list mean it allows IP addresses or ranges that are added to the list. To add port override and trusted IP list just click on the advanced profile settings. 4. History: History option shows all the history of network traffic and firewall activity. It shows both upload and download activity; also inbound and outbound connection. The inbound are shown with green arrow and outbound with a blue arrow. 5. Activity: In this section you can see all the application activities. The number of bytes sent and number of bytes recieved are listed next to the application name. If you double click on the application then you can see the summary, connections, and listening options. 6. Settings: In settings option you can modify various settings. You can modify general options like firewall mode, network settings, filtering, you can set password, fullscreen mode, and preferences. 7. Upgrade: If you want to upgrade your PC Tools Firewall Plus from free version to paid then you can click on this option. But the free version has all the functions required for a normal PC user. This free firewall application is a good solution to set a firewall to your PC manually. But after installing this application your internet connection might slow down; as it happened to me while testing this software. On an average this application works well and good for protecting your PC from external threats like malware, virus, intruders, etc. 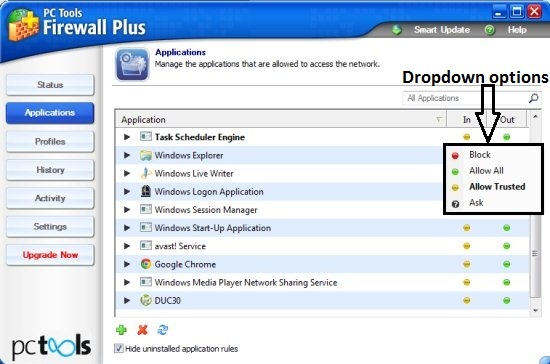 Click here to Download PC Tools Firewall Plus.